SKU: 6810359 Categories: Anatomicals Face Masks & Face Cloths, Face Care, Quick add ons, Sale, The Soap Opera Mama. Tags: €10 & under, €5 & under, cleanser, mud mask. They seek it here, they seek it there. those beauty lovers seek it everywhere. is it stores? is it on the line? that damned elusive pimplehell. 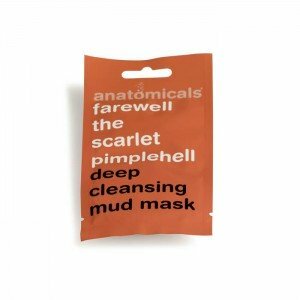 Anatomicals Farewell The Scarlett Pimplehell Face Mask is ideal for a weekly treat. This deep action mask works to boost circulation and deeply cleanse pores, purifying your complexion. Skin is left refreshed, smooth and glowing. This product may not be a life saver, but it does clean your skin and absorb excess oil, controls acne, controls blackheads, and leaves skin very smooth. It has a nice consistency and is easy to apply to your face. You should leave it on for 10-15 minutes. it will leave a very pleasant feeling of freshness and a proof that it is actually deeply cleansing your skin. After 15 minutes it has dried and becomes like a tight layer on your skin. You can then wash it down with lukewarm normal water. Aqua, glycerin, sodium cocoamphoacetate, xanthan gum, green clay, kaolin, talc, glyceryl stearate, cetearyl alcohol, fragrance, CI42090, phenoxyethanol (and) methylparaben (and) ethylparaben (and) propylparaben (and) butylparaben (and) isobutylparaben, sodium acrylate/acryloyldimethyl taurate copolymer (and) isohexadecane (and) polysorbate 80.